The residents and road users at Aburi in the Akuapem South District of the Eastern Region are full of joy as work is steadily ongoing to improve their road networks. The Aburi roads have been in terrible shape for many years despite promises by previous governments to fix them. However, through the effort of the Akufo-Addo administration, the Akuapem South District Assembly is doing everything possible to reshape the nature of the roads to reduce the burden on road users. 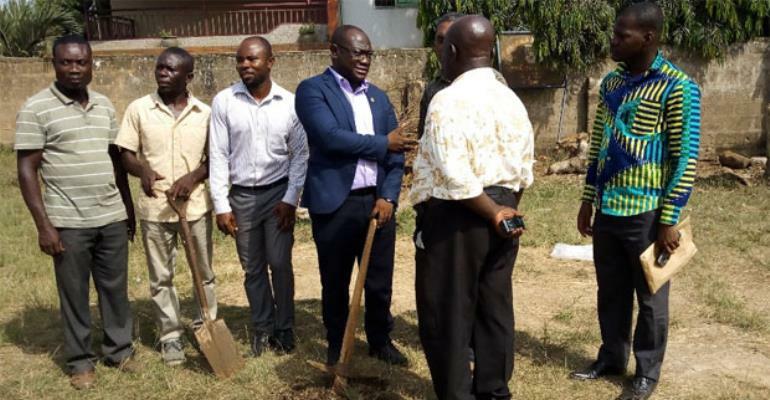 The District Chief Executive (DCE) for Akuapim South, Frank Aidoo, who toured some parts of the district to inspect the roads currently under construction, told DGN Online that about 63-kilometre stretch of roads have been revamped, but he believes a lot has been done with regard to the refurbishment of roads in the district. He said, “We are reshaping all the roads in the district. But there is a road in Aburi which poses threat to road users around that is a 10-metre entrance to Aburi and looking at its nature, reshaping it will not help and that the assembly has made it a concrete road it due to the terrain and could have done more if we were financially strong, “he added, hinting that the Jankam road and other selected ones would be made a concrete road, having provided the needed materials to commence its construction in the course of the week." Mr. Aidoo stated that by close of the week, they would be done with reshaping of some roads around Dago. After the inspection, the DCE also cut the sod to commence the construction of a kindergarten block for the Ahwerease Presbyterian School in the area. The project would support other infrastructure in the school.